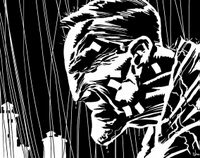 A Sin City style sample done for a client. Drawn without reference (I'll have to buy those books one day). 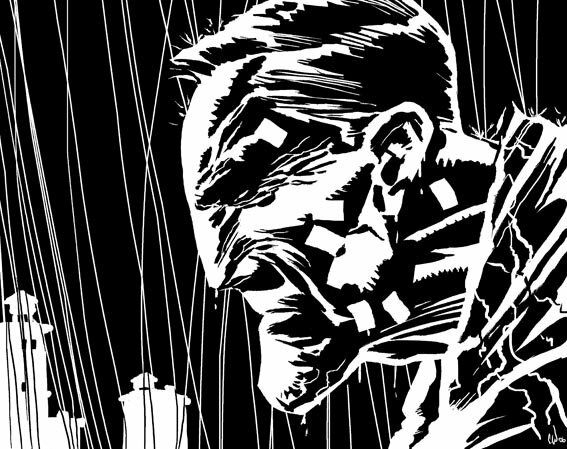 It's for a storyboard job I'm currently doing, where the client wanted the frames to have the mood of Sin City. In the end the artwork will look nothing like this. Would have been fun to experiment in this style though. But, it got me the job so that's all that matters. On a similar note, one of the all-time favourite toys in my collection is a Sin City 'Electric Chair Marv' figurine. Throw the switch and the chair vibrates, his eyes glow red and he laughs, 'Is that the best you can do, you pansies'. Classic. My 1st visit, nice work. I'll come back for more. Chris, that's pretty great drawn from no reference. And that Sin City 'Electric Chair Marv' figurine is a classic, wish I had got one when it came out.